Neon pulses from a fallen tree. Coral, tangerine, red-orange all spill out of the log in ruffled waves, white foam building underneath. How could this much color grow out of so many forest greens and bark browns? More than appetizing, these scalloped layers appear radioactive. But you’re actually looking at 20 lbs of free chicken. 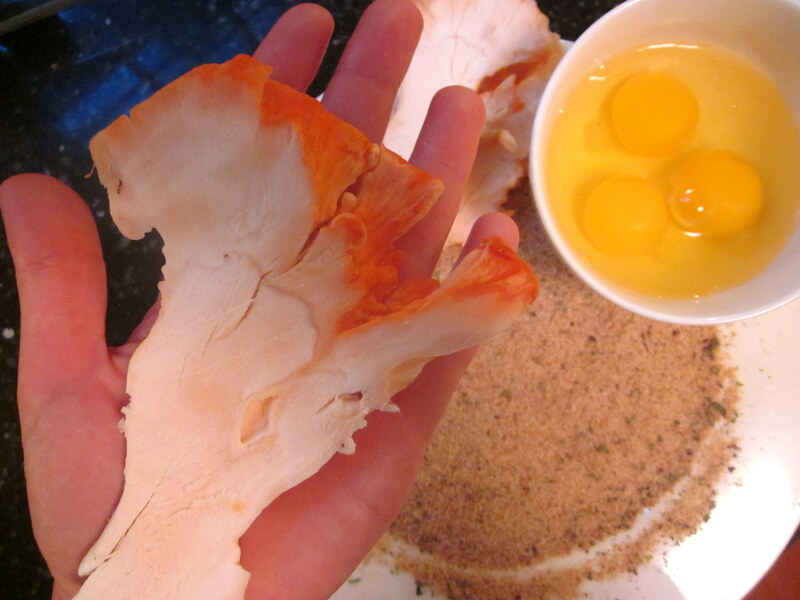 This is the chicken of the woods mushroom, one of nature’s playful tricks. The chunk pictured here, spotted on a hike in Virginia, is a nearly 20 lb arm-straining mass, more akin to a whole roasting chicken than a box of button mushrooms. These mushrooms can range anywhere from a small cluster to a hulking 100 lb bracket –stumbling upon a large specimen can satisfy a whole season’s worth of mushroom cravings. Chicken of the woods needs to be cooked to be edible. Specialists also advise making sure that the mushroom’s host tree is hardwood, noting that species growing on eucalyptus or conifers may cause “gastric upset” – nothing deadly, just unpleasant and avoidable. Once you track down a chicken of the woods, remember the spot where you found it: it will continue to regrow in the same place until it kills its host tree and then depletes all the nutrients from the wood, so you may very well have a reliable stockpile for several years. 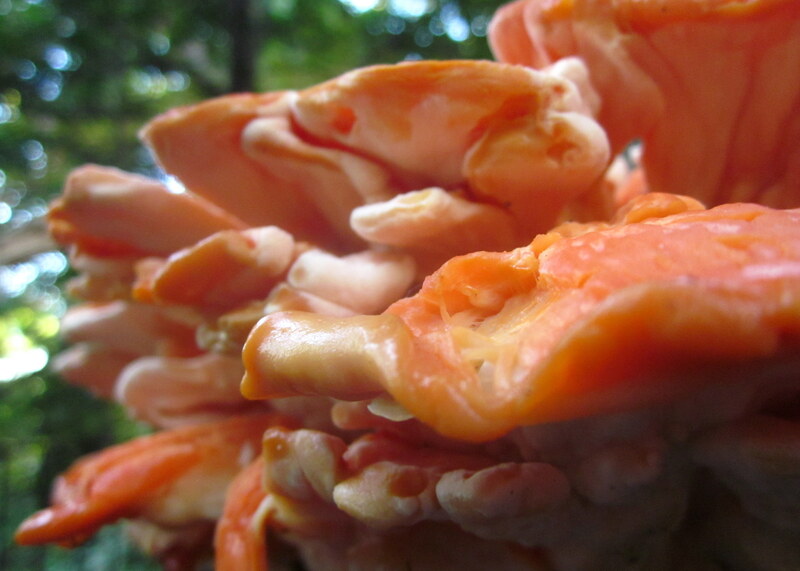 The name “chicken of the woods” may have you thinking of hen of the woods, also known as maitake, but the two are distinct. 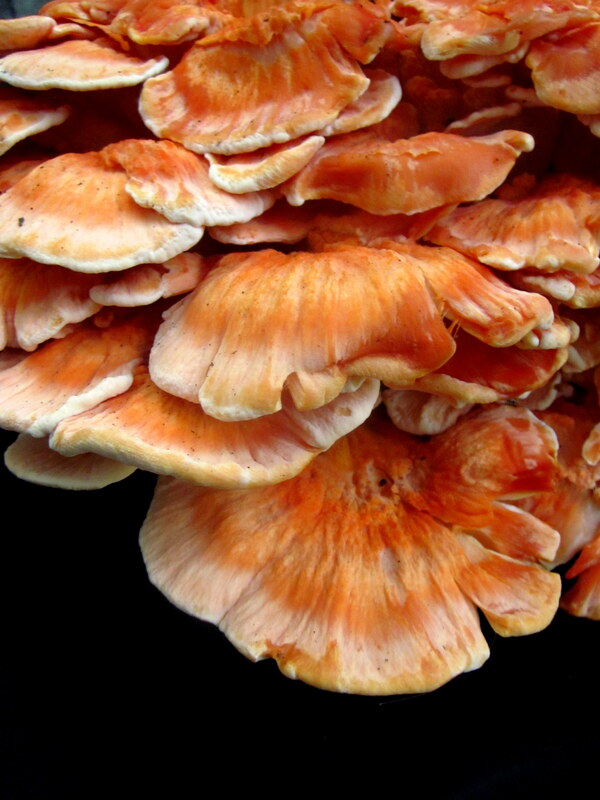 Maitake earned its nickname from its exaggerated ruffles which resemble a hen’s tail feathers. 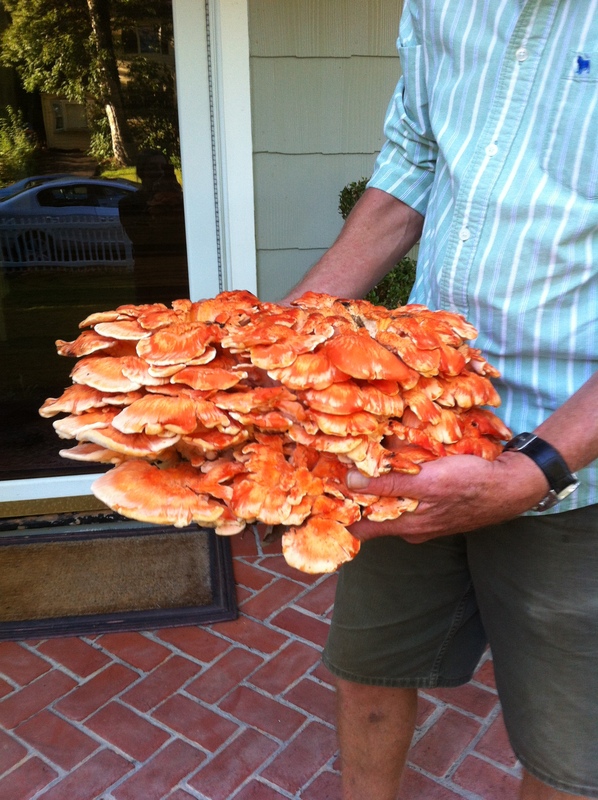 Chicken of the woods, instead, has a more bewitching connection to poultry – take a bite and, like Alice in Wonderland, you’ll be sent careening down a rabbit hole to, well, chicken. Some detect a hint of lemon that reminds them of crab or lobster – and the coral outer color of the mushroom, which holds when cooked, no doubt adds to this effect. But more than anything else, it’s the chewy, sinewy texture – just like a grilled chicken breast – that squawks. This mushroom masquerade is testament to how texture can trump taste, often with no particular logic behind it. More than taste, texture is the reason people are completely turned off by certain types of food – bananas, ickily mushy; okra, eerily slimy; aspic, uncannily giggly. But texture can also be sublime: feather-light mashed potatoes, the crystals in a quality chunk of parmigiano, meringue that dissolves on the tip of your tongue with a faint fizz. In China, there is a word for these memorable encounters: kou gan, or “mouth feel” – a term often reserved for the singular gristly, slippery, elastic sensations of such beloved specialties as shark’s fin, goose intestines, chicken feet, and sea cucumber. North American attitudes tend to be more suspicious of odd textures. Mushrooms are famously held in contempt, in contrast with most other parts of the world. Only recently has offal begun to overcome its stigma and land on sought-after plates. Big Food is well aware of just how particular we are about texture. Food companies have zeroed in on our quirks and turned them into a science – “food rheology,” which has now introduced terms like “mouthfeel” to our own language. Experiments in this realm categorize people according to their texture preferences (one divides consumers into categories of “smooshers,” “crunchers,” or “suckers” – at the end of the day, we’re just animals smacking on food), and a whole psychology of texture has emerged, full of its own emotional associations. Studies show, for example, that people tend to think soft or smooth foods have higher calorie counts than hard of rough foods. Texture is also being studied as an indicator of quality perception in food – like pulp giving the impression that orange juice is fresh-squeezed. 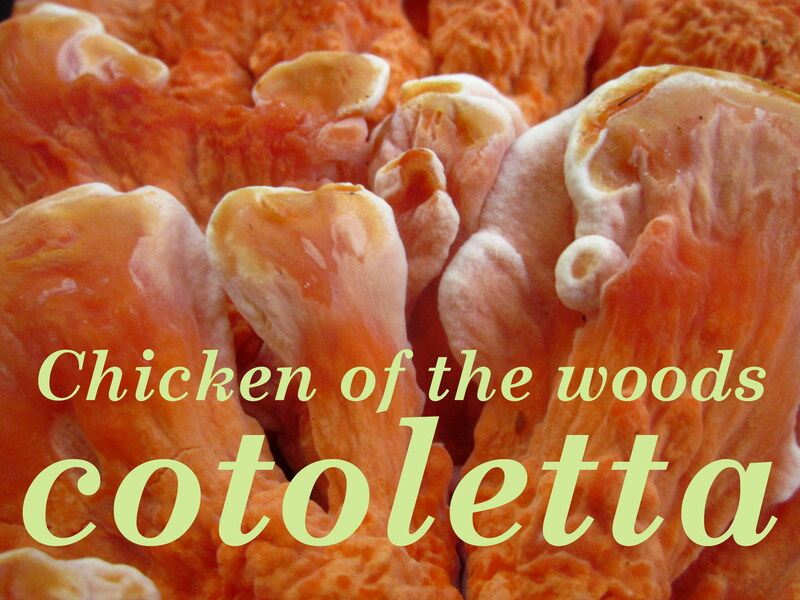 With chicken of the woods, you can use the power of texture to your advantage to make a range of dishes that will have everyone thinking “tastes like chicken” while pleasing vegetarians and carnivores alike. You can sauté the mushroom with olive oil, garlic, and parsley for a light pasta sauce, simmer it with tomatoes in a hearty ragù, stir it into creamy risotto, or fold it into eggs and Gruyere for a fluffy quiche. 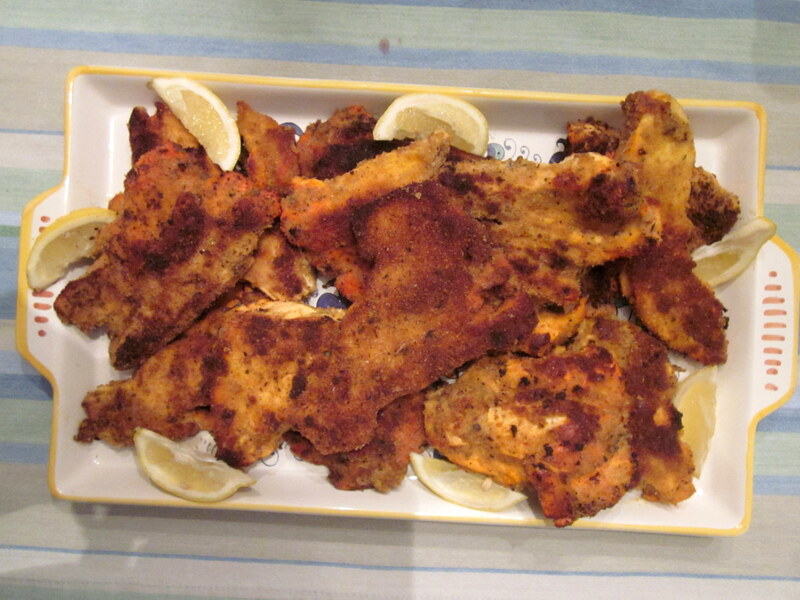 But perhaps most impressive of all is chicken of the woods’ ability to hold its ground in a veg-friendly schnitzel, or “cotoletta” in Italian. Breaded and pan-fried, the mushroom won’t have you thinking about what you’re missing, like mourning juicy beef when biting into a Portobello burger. And, unlike soy bacon and other “meetz,” you won’t be faced with a list of mysterious ingredients that rivals the Magna Carta. 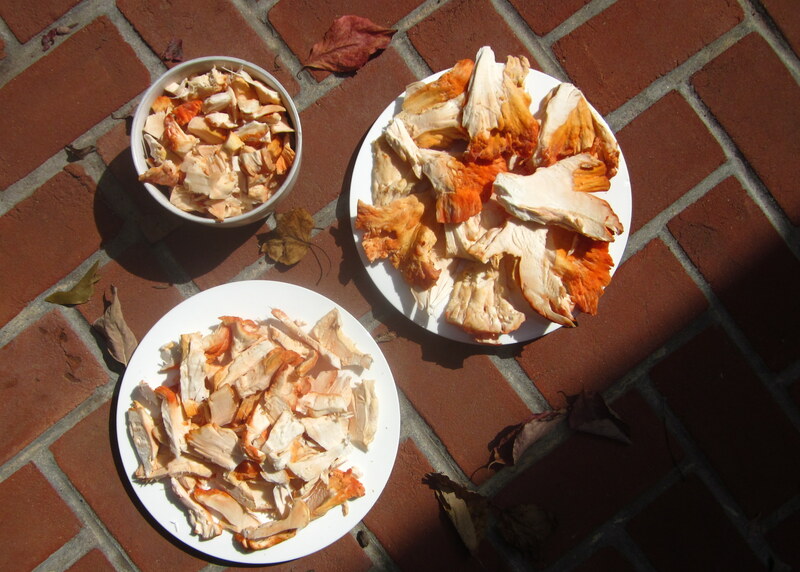 If you’re lucky and stumble across a big chicken of the woods (and are still standing after carting it back down the mountain), you can save any extra not used that week by cleaning it and then dehydrating or freezing it, so you can enjoy it throughout the off-season. It’s best to cook the mushroom before freezing, since cooking after defrosting will leave you with more watery and less flavorful bites. 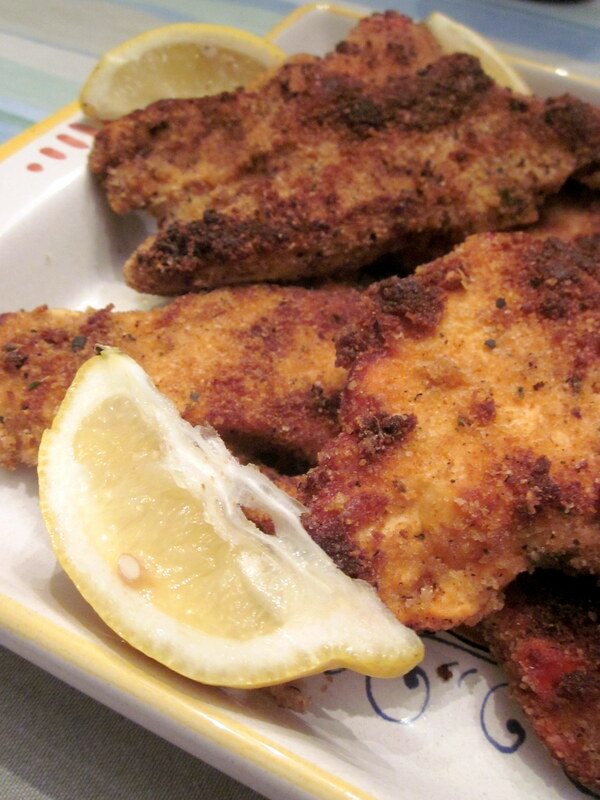 At the very least though, even if you can’t find chicken of the woods, or if you can’t bring yourself to eat something growing out of a log, I hope this recipe helps inspire you do some more double takes as you walk throughout your day – you may be speeding by some free chicken. 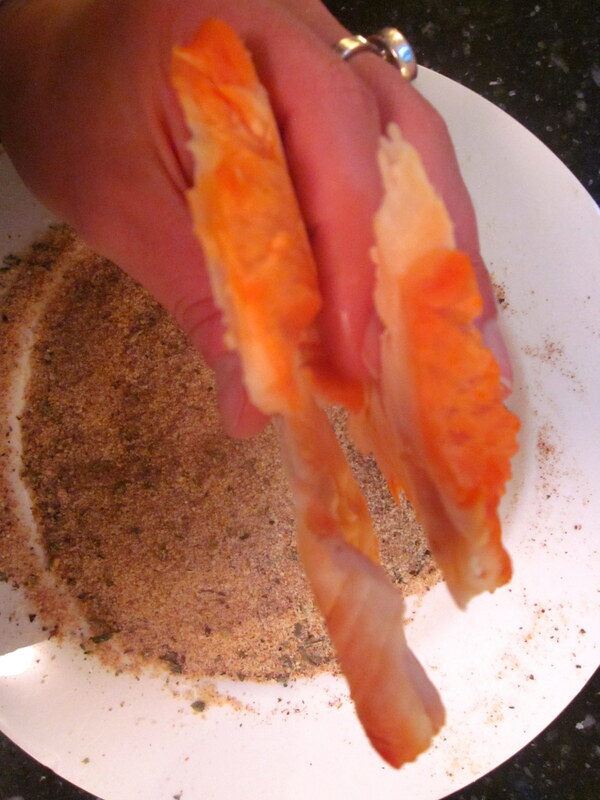 8 chicken of the woods “steaks” — To get a “steak,” break apart the mushroom into chunks by slicing each scalloped layer where it connects to the main core. Trim off any woody (often closer to the core) or waterlogged (sometimes at the thinner outer edge) parts, and wipe off any dirt with a cloth. Then slice the pieces into planks, flat on each side and roughly ½ inch thick (see picture below). I ended up with steaks just slightly smaller than my hand – depending on how large the steaks are you can pan-fry them in one or more batches to make sure they don’t get too crowded. 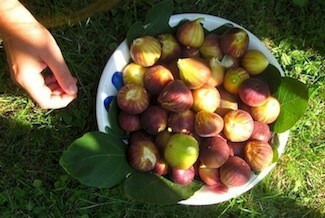 Beat the eggs in a shallow bowl, and mix breadcrumbs and seasoning in a second shallow bowl or plate. Fully coat the mushroom steak in the egg (hold it above the bowl for a second so any extra can drip off) and then the breadcrumbs. Repeat with the three remaining steaks. Heat half of the olive oil and half of the butter in a wide-based skillet. Once the butter has stopped foaming, add the mushroom steaks. Heat the remaining butter and olive oil, and repeat with the remaining steaks. 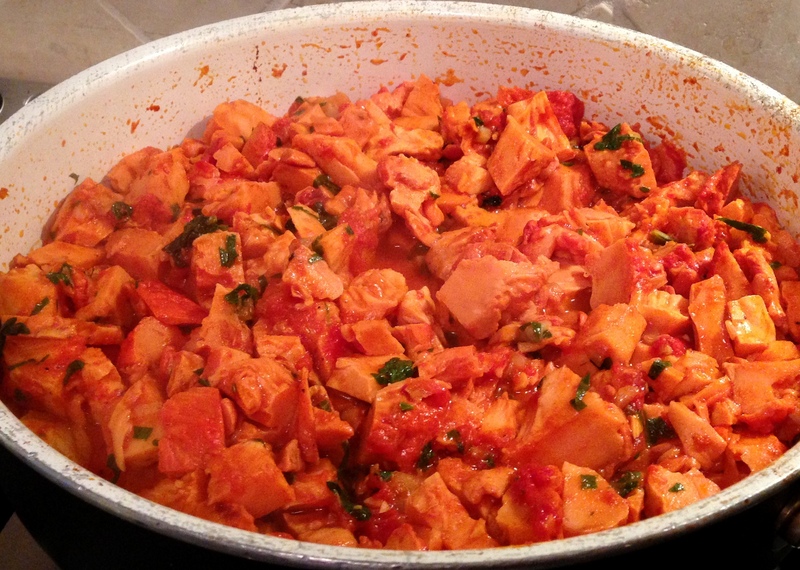 ← The Creole Chesapeake: Fishing for Peppers in Baltimore and D.C.